Ticket packages for our 2019/20 concert season are on sale now! Our ticket packages save you up to 35%, guarantee you the best seats in the house, and give you great benefits. You can choose to attend by concert series – or mix and match your favourites with a U-Pick package. Single tickets are also available now for all our 2018/19 concerts. Single tickets for 2019/20 will go on sale August 1, 2019. First-time subscriber? Buy one subscription package and get your second for half price! Contact the box office today to take advantage of this special offer. You can also find our first-timer’s order form here. Want to skip the Box Office lines? Click here to learn how to renew your 2019/20 ticket package online! Choose your favourite 4, 6, 8, or 10 concerts from our entire lineup and save up to 20%. Under age 30? Save even more with our Under-30 U-Pick. Learn more here. All prices include HST. New this season: first five rows at St. Andrew’s United Church, Halifax. Please note: U-Pick seats are assigned after series subscription orders are filled, so you’ll be sitting in the same section – but not necessarily in the same seat – for each concert. To view a seating chart of the Rebecca Cohn Auditorium, click here. Save up to 35% when you order all the concerts in one of our pre-set concert series. * Masterworks “Piano Pack” includes Nov. 21, Feb. 13, Feb. 27, April 22, and April 23 concerts. Masterworks “Variety Pack” includes Oct. 24, Nov. 7, Jan. 16, March 12, and March 26 concerts. ** Full Fusion Series includes all Symphonic Fusion and Maritime Fusion concerts. *** For Baroque concerts at St. Andrew’s United Church, “A” seating is designated for the new Front 5 rows, “B” seating is the balcony, and “C” seating is the floor. Add on extra tickets with your package and save! Buy additional single tickets with your package and save even more! * For Baroque concerts at St. Andrew’s United Church, “A” seating is designated for the new Front 5 rows, “B” seating is the balcony, and “C” seating is the floor. Ticket package holders get first choice of seats, and can keep them for every concert in your package. Then, you can renew those seats year after year! 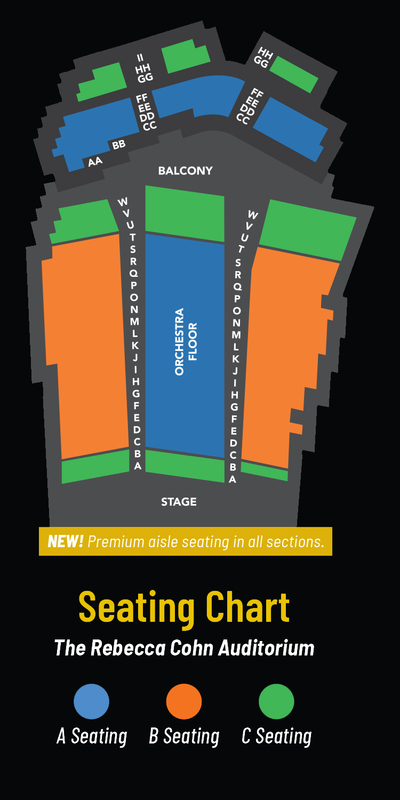 Please note that U-Pick package holders will be seated in the same section — but not necessarily the same seat — for each concert. Ticket package holders can exchange tickets for other Symphony Nova Scotia performances of equal or lesser value. What’s the easiest way to do this? When you order your package, have the box office hold your tickets and pick them up there before each concert. Then, whenever you need to make an exchange, just call the box office ahead of time (preferably 24 hours) to switch your tickets for another concert. Or, if you prefer, we can also exchange your tickets for a donation tax receipt of equal value. Please note that exchanges are subject to availability and are not applicable for concerts sold outside of the Dalhousie Arts Centre Box Office. The best available seats are available to you first — before single tickets go on sale to the public! Your subscription will save you up to 35% on single ticket prices. Buy extra tickets for less. You’ll save 10% on all tickets you purchase beyond your subscription. Exchange tickets at no extra charge. Things change, and when they do we’ll exchange your tickets — for free! Get our pre-concert e-programs in your inbox. We’ll keep you in-the-know with program notes, guest artist biographies, and more. Use your open rehearsal voucher for a free ticket to your choice of Symphony open rehearsals at the Dalhousie Arts Centre. Check your coat — for free! Enjoy free coat check at Symphony concerts at the Dalhousie Arts Centre. Enjoy a better bar experience. You’ll save on bar purchases at Symphony concerts at the Dalhousie Arts Centre. Plus, stay at the front of the line when you pre-order your drinks for intermission! Seasons by Atlantica Restaurant is perfect for pre-concert dinner or post-concert drinks – and even better with your 15% discount! The next time you’re out of town, hire Domicare’s Kathy MacCulloch to mind your home and your pets and save 10%. You can pick up your season tickets in person, over the phone, by mail, or by fax. Click here to order. If you’d prefer to fill out an order form before you contact us, you can download it here. And if you’re a first-time subscriber, your form is available here.